Marcelo de Oliveira Müller is senior partner and head of the trademark prosecution division at Ouro Preto Advogados. He has more than 24 years’ practice in the IP field, with a special focus on trademarks. 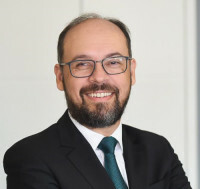 Mr de Oliveira Müller has a JD from the State University of Rio de Janeiro and an LLM in IP and technology law from the J Thomas McCarthy Institute for Intellectual Property and Technology Law at the University of San Francisco School of Law (2003-2004). For many years he was head of the trademark division at one of the main Brazilian IP firms, and after that he had his own practice for nearly two years, until he joined Ouro Preto Advogados in 2019. His wide career path guarantees his expertise in managing all sizes of IP portfolios, for both domestic and foreign clients, with his main areas of practice being consultancy and prosecution in trademarks, trademark registration, agreements, company names, domain names, unfair competition, trademark counterfeiting, computer programs, copyright and the Internet. Mr de Oliveira Müller is a member of the Brazilian Bar Association and a licensed industrial property agent. He is an active member of INTA and is chair of the Latin America Subcommittee of the Unreal Campaign Committee. He is fluent in Portuguese, English and French.